Finally MuteCity DMGs now has itself a .com and a new name! We will now be trading under Mute City Electronics. We have also gotten a much wider range of products a inculding the Glitch Nes 0.2, krikzz's outstanding flash cartridge range, and even some boxed reproductions- no shop has ever done any thing like this before! We also have more custom gameboys on their way. Our new artist is working on them right now and we should have them by the end of the week! I'm working on a really cool Super Nintendo mod at the moment which will be up in our new custom shop in the next coming week. My blog has also been moved to the new store so if you want to know more about what we are up to just check it out. We have also open a twitter account with you can follow HERE for those little updates. Hello all, I haven't updated the site in quite a while and I wanted to let you know what's been going on. I have been keeping busy selling NES and SNES reproductions for the last while, But I have more time on my hands these days and I want to get back into custom consoles. So I teamed up with a very talented graffiti artist who goes by the name of Crept, you can check out his Flickr here. He will be doing all the custom paint jobs for the site from now on. I have one custom Playstation which he is working on. Here is a sneak peek. As well as more custom consoles, I am planning to open a new online shop soon with LSDJ cartridges and other interesting products. But right now we are still in the planning stages. I will update you when there is progress. Rest assured there will be a lot more things happening here in the near future. We should have some Glitch NES 2 cartridges soon and I'm also working on some Neo Geo projects which I will blog about soon. In the meantime I would love some feedback on the Playstation. Glitch NES and much other games have a new lower price of 25 dollars shipped. For those of you that don't know what Glitch NES is Let me explain. 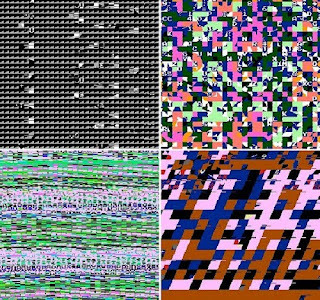 Glitch NES is a cartridge for your Nintendo entertainment system that causes graphical glitches similar to hardware circuit-bending. Here is a copy of the best hack of all time! Moon Crystal in english, It is a famicon game. It very good, has a Prince of Persia feel to it. This game is 25 dollars shipped. It is known as SMB2J or the lost levels, it was only released in japan on the famicom disk system. It is in my eyes a much better game then what we got! Here is a copy of the unreleased Final Fantasy 2 for the NES, Some of you many be thinking is Final Fantasy 2 not for the super NES. That game is really Final Fantasy 4, Nintendo didn't released a large part of the Final Fantasy in the west. Sweet Home is a RPG horror game that again only was only released in japan on the famicon, I haven't played much of but it but I hear it's a great game. I have for you another great RPG that was only released in japan on the famicon. It's YS Book 1, Now the west never got any games for the YS series on till the third game. It the Donkey Kong Country Competition Cartridge. As most of us don't have the money to buy the real thing I had a repro of this game for those who just want to play it. But I don't want a repro of it finding its way on to ebay for 500 buck or more so im only selling this to someone know and have sold to before. I have very proud to but making cartridges of the world’s first native NES music tracker! I can't wait to see what new flavor this will bring chiptune! It was made by Neil Baldwin and he has been just giveing a way the ROM, check out the NTRQ blog. Is neil getting any of the profits from these carts? Well yes and no, I asked him did he want a share but he would like it to go to charity. So for ever cartridge I sell 5 dollars will go to Cancer Research. The cartridges will be 40 dollars each inducing shipping worldwide! I have a very small stock of these so grab them while you can. Cartridges are in an NTSC format! If you would like a PAL copy email me at mutecitydmgs@gmail.com and we can work some thing out. Glitch NES Cartridges are in stock. Here is a little look at a finished cartridge and a few screen shots. This lovely label was made by Thretris.There is a link for his site in my friends section. The cartridge will not damage your NES or circuit-bend it! The NES will play as normal when the cartridge is removed. These cartridges are 30 dollars each plus 5 dollars for shipping. Carts are in an ntsc format! MuteCity is now on Twitter! Yep, So start following to keep updated on my project, New products and well what ever is on my mind. or even Chrono Trigger (german or french) you know where to get it. Here is a look at a finished Cart.